(Nanowerk Spotlight) Since the genesis of the research field of molecular electronics, which is generally considered to have begun in 1974 with Aviram's and Ratner's early theoretical research ("Molecular rectifiers"), tremendous progress has been achieved both theoretically and experimentally by scientists and engineers who were fascinated by intriguing physical, chemical phenomena, and potential device applications of molecular junctions. In a recent paper in ACS Nano ("High-Yield Functional Molecular Electronic Device"), scientists review recent experimental efforts for pursuing high-yield functional molecular devices, in which a bundle of molecules (the contacted molecules number more than ∼1000) is contained in a junction. The authors point out that several excellent reviews of the active field of nanoelectronics are available pertaining to single molecule junctions or ensemble molecular junctions (see for instance: "Molecular-Scale Electronics: From Concept to Function"). In contrast, the overarching aim of their review article is to provide an overview of diverse experimental efforts for realizing the practical devices of the ensemble molecular junctions apart from single molecule junctions, in which distinctive electrical features are observed with high device yield. To do so, they first summarize in detail a number of different approaches for achieving high-yield ensemble molecular junctions and discuss the practical applicability and suitability as a reliable practical device platform. To provide a thorough review and comparison, they also mention traditional testbeds for the ensemble molecular junction, which usually lead to low device yield. They then address primary advances in building functional molecular devices with desired functionalities based on the high-yield molecular junction platforms with programmed functional molecules. For example, they highlight the potential applications of molecular diodes, photoswitching devices, memory and optoelectronic devices. With those functionalities, the authors discuss other considerations for real-life applications such as devices on flexible substrates and integration of the devices – aspects often neglected in previous reviews. Finally, at the end of the review, they note the key issues critical to the success of the next-generation high-yield functional molecular device. 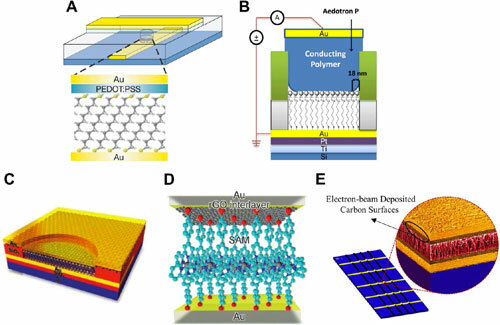 The researchers note that their overview aims to provide a better understanding of the current status of the rapid progress in the field of molecular electronics for the realization of commercially available functional molecular devices, which might be of crucial importance for the development of alternative electronics.